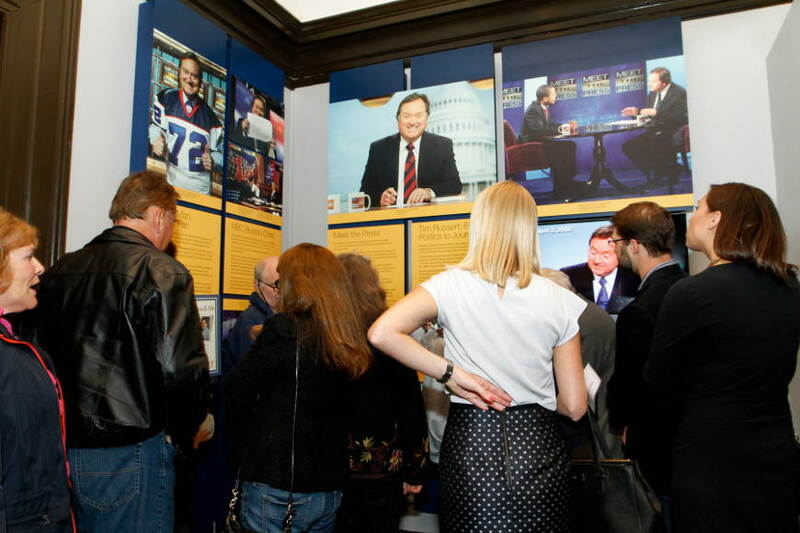 Entitled “Inside Tim Russert’s Office”, the exhibit honoring the late great “Meet the Press” host and award winning journalist has made its way to the Buffalo History Museum. Russert a native Western New Yorker and Canisius High School grad, became one of this generation’s best on air journalists. Previously housed at the Newseum in Washington since 2009, the exhibit’s location was to be only temporary. For close to a year The Buffalo History Museum, Congressman Brian Higgins, along with the Russert family worked to bring it home. When the green light was given, staff from the Buffalo History Museum went down in June to personally retrieve the Russert artifacts. The goal was with the help of the Newseum, to preserve in its authenticity, the re-creation of the office. In its entirety, visitors at The Buffalo History Museum will see Russert’s office as it looked when he passed away in 2008. From shelves filled with his favorite books, many whom he had interviewed, along with handwritten notes, a photo of Pope John Paul II, and even a script from a 2004 George Bush interview, museum goers will get a good look into Russert’s days in Washington. One of the most iconic images is the wooden plaque in front of his desk that reads “Thou Shall Not Whine”. Perhaps one of his daily reminders to fellow staff. Among the sights are Russert’s greatest passion, his family, with photos of family and close friends on the walls reflecting his Buffalo upbringing. Of course the exhibit isn’t complete without his favorite sports team. Russert an avid fan, would end his show during the fall with “Go Bills”. A Buffalo Bills pennant and a picture of him in a jersey on “Meet the Press” help decorate his office walls. The Buffalo History Museum has also expanded the exhibit to showcase a bigger Western New York presence. A standing desk covered with research, notes, and various Buffalo publications has been added. Russert would use it to prepare himself for the daily journalistic challenges. A model of Offerman stadium where Russert grew up watching his Buffalo Bisons can be seen. Also a Blizzard of 77 case is out for viewing, along with a short video that details the life and career of Russert. Higgins who helped narrate the short film, gave great insight on how the blizzard helped introduce Russert to the national spotlight. All in all the exhibit and its new home will bring about a sense of nostalgia that comes with such an iconic presence. Viewers will see a strikingly detailed observation of one of the most beloved and respected journalists since Edward R. Morrow. Even more breathtaking considering Russert began as a small town guy taking on Washington’s biggest goliaths. He climbed the ladder at NBC eventually becoming a Senior Vice President at “NBC News”, became a best-selling author, a Presidential debate moderator, and was named by Time Magazine as one of the “100 most influential people” before his passing. The exhibit opens to the public on October 17th. The Buffalo History Museum is located on One Museum Court Buffalo at the intersection of Elmwood Avenue and Nottingham Terrace. Parking is free, and admission is $7 for adults, $5 for Seniors (60+) and Students (13-21), $2.50 for Children (7-12), and free for kids under 7. For more information on the Buffalo History Museum, visit www.buffalohistory.org.